Dinner is most likely the meal in our house that changes the least often. We have our two or three soups, two or three meat/seafood or pasta dishes. More often than not, we'll just have a salad or an omelette. Between those listed we rotate on a weekly to bi-weekly basis. All these dishes are actually really nice. But every now and then comes a point when none of these tickle my fancy. I don't have any problems coming up with a new cookie or cake recipe. But dinner? It's costing me gray hairs. Lunchtime is my chance to try out new recipes, as I am home alone and only have to feed myself. Seldomly, my lunchtime creations make it to the family dinner. It would often be too veggie, too raw, too green, too many nuts and seeds..... for the other diners around the table. 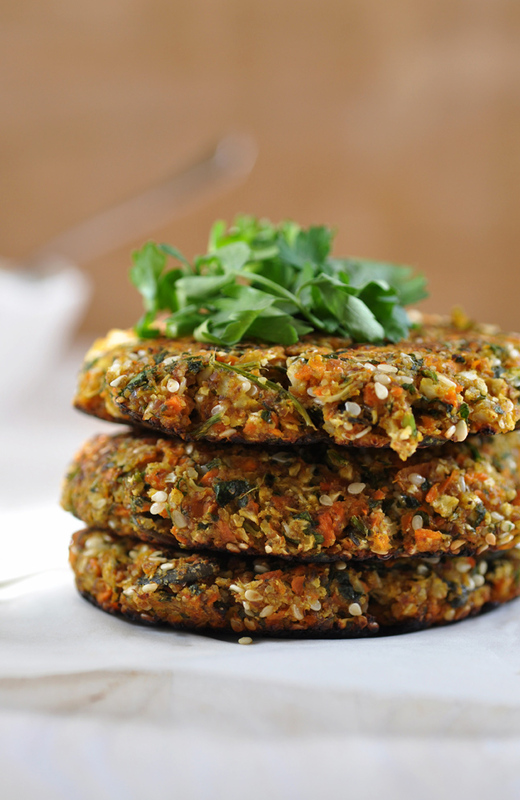 These vegan falafels are most of the above: full of fresh veggies, herbs and seeds, held together by flax eggs and almond meal. I t cannot get more nutritious: vitamin and mineral bursting carrots, cauliflower and parsley combined with omega-3 rich flax meal, almonds and seeds. I love their soft crunch coming from the seeds and the cauliflower. What I like even more is the fact that all sorts of lonely vegetables from the back of the fridge can be used: I can imagine parsnips, sweet potato, zucchini, bell peppers, kohlrabi or broccoli in this. The parsley can be replaced by spinach, cilantro or chives. The spices can be substituted by anything that tickles your fancy: The Healthy Foodie has cinnamon and paprika in her fritters. An awesome combination that I had never tried before. Highly recommendable. I like these falafels with a thinned and seasoned tahini sauce and a fresh salad on the side. Enjoy! In am small bowl, combine flax seed with boiling water and stir until well combined. Let stand for a few minutes to thicken. In a food processor, combine cauliflower, carrots, onion, garlic and parsley. Pulse a few times until coarsely chopped. Add lemon juice, cumin, salt and cayenne and pulse again to blend. The mixture should be very finely chopped now. Transfer mixture to a bowl. Add flax seed mixture and almond meal and knead until mixture holds together. Add more almond meal if the mixture seems to wet. Add sesame and pumpkin seeds. Form patties of the size of the palm of your hand. You should get about 6 patties out of the batter. Coat a frying pan with olive oil and cook patties over medium heat for 3-4 minutes on each side, or until lightly browned. Serve immediately with a fresh salad and tahini or yogurt dip.